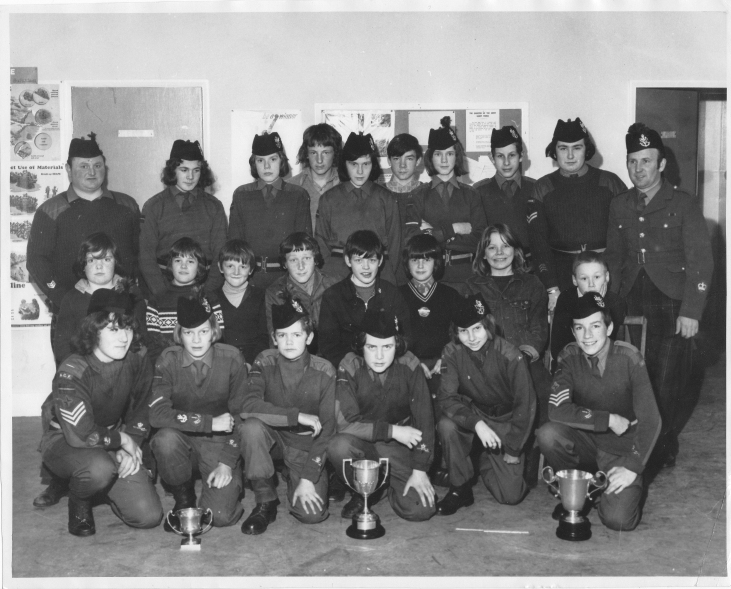 Thanks to one of the regular Gurnites for this image of the Nairn Army Cadet Force around 36 years ago. Front Row: Billy Innes, Ian Wilson, David Pettit, David Fraser, Ally Ross, Tommy Crosbie. Some of the spellings of the names may be incorrect. Can anyone identify the missing names? View a larger image here on the Gurnflickr pages. Front row Billy Innes,Ian Wilson,David Pettit, David Fraser,Ally Ross and Tommy Crosbie. Love the hair on some of the boys, a few of them have a lot less of it now. Aye, those were the days. Middle row first left boy is Bertie Palmer. Davi/Tony thats the guy I can't place. Found out that 1st youngster in middle is Bertie Palmer. David I take it you meant 1973 and not 1993 ? I havent seen ronald mackay or davie connachan in years which is a shame as we grew up together in Barbour Road.